Immune therapies for gastrointestinal (GI) cancers have actually been tested over several decades. Early attempts at immunotherapy focused mostly on the enhancement of the immune response systemically and nonspecifically by the addition of agents such as interferon (IFN), interleukin-2 (IL-2), levamisole, and bacille Calmette-Guérin (BCG) (1). These efforts have not resulted in effective therapies. The more recent work has focused on enhancing the immune system against specific tumor-associated antigen(s) (TAAs). 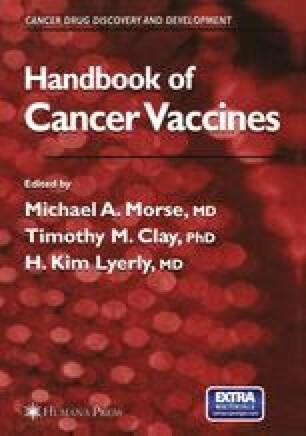 Many vaccine and immune-based therapies are/have been tested that utilize a cancer-specific approach instead of nonspecific enhancement of the immune system. These approaches are attempting to take advantage of our increased understanding of what distinguishes cancer cells from normal cells with the goal of developing effective and nontoxic immune therapies for cancer patients. It will be these therapies on which this chapter will focus.